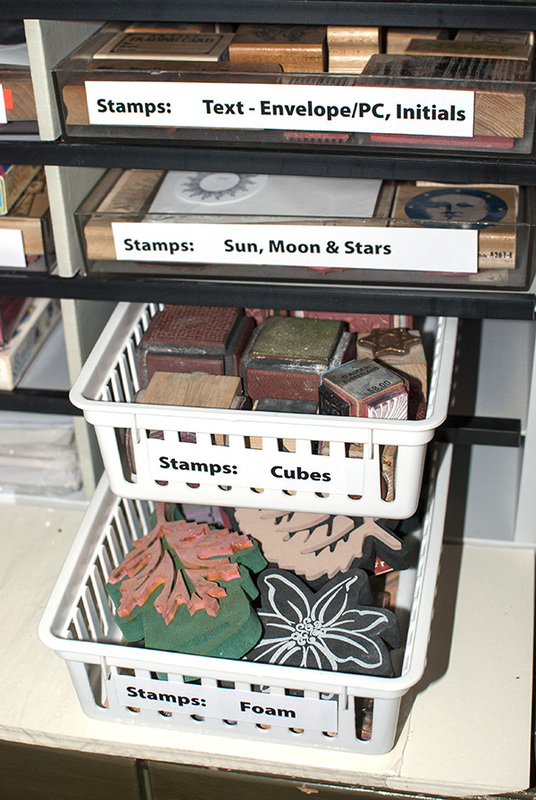 Every stamper has to face the dilemma of how to store the stamps. The solution for each stamper varies by the number of stamps (and how often you acquire more! ), the space available, how the stamps are mounted, and how much money you want to spend. I’ve got a lot of stamps. I’ve never counted them. (A hoarder’s denial maybe?) Probably about half of them are mounted and half are unmounted. 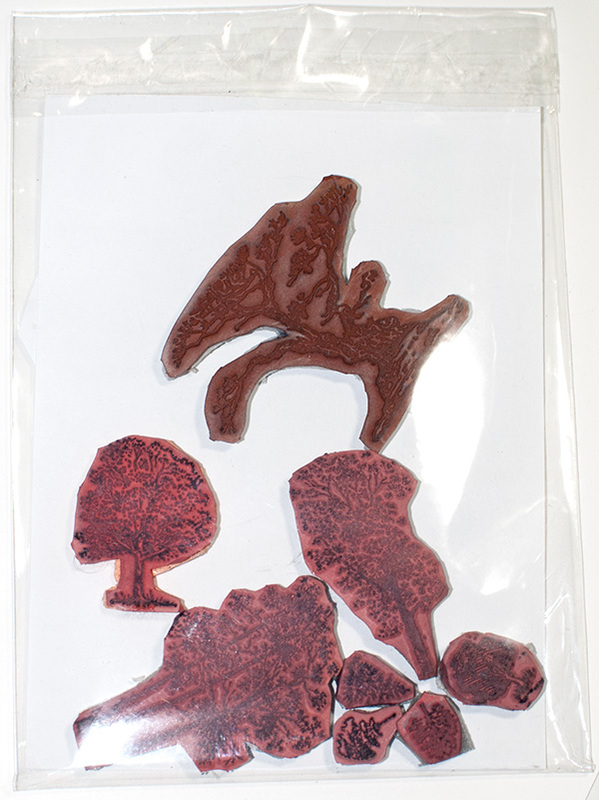 (Most of the “unmounted” are more accurately described as mounted on cling ushion for use with acrylic blocks.) My craft area is about a quarter of a large room, so I have a reasonable amount of space available. I tend to lean toward makeshift and second hand stamp storage rather than spending a lot of money on new storage units. This is how I store my stamps. I’ve been sorting and reorganizing my craft area recently. (See yesterday’s post about temporary stamp mounting.) In the process I rearranged my stamp storage, tweaking my system a little bit by combining cushion-mounted and mounted stamps in the same storage space. 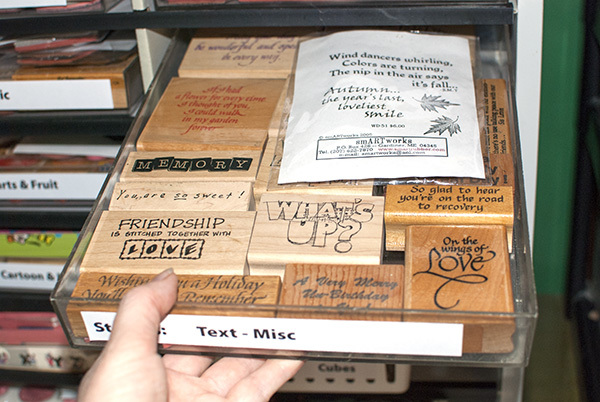 Formerly, I stored mounted stamps in shallow drawers and unmounted stamps in boxes. After finally getting cling cushion on most of my unmounted stamps, I decided to move them out of the boxes and into the drawers with the mounted stamps. I think this way I’ll use my cushion mounted stamps more often. My stamps are stored in three types of shallow drawers. The first is a thread storage display unit acquired twenty or so years ago from a fabric store that was changing them out for some other type of display. It didn’t cost me anything. I don’t remember who first thought of using these units for stamps, but it really works well. The unit came with curved inserts to hold spools of thread. When they were taken out, what was left were large shallow metal drawers, all the same height, but larger (deeper front to back) on the bottom and becoming shallower as the drawers reach the top. The unit sits on an inexpensive wood storage unit (a re-purposed TV stand where I store spray paint and other supplies) and the top rests comfortably against the wall. The second type of stamp storage is a small metal unit with shallow drawers, purchased second hand for almost nothing, again twenty or so years ago. 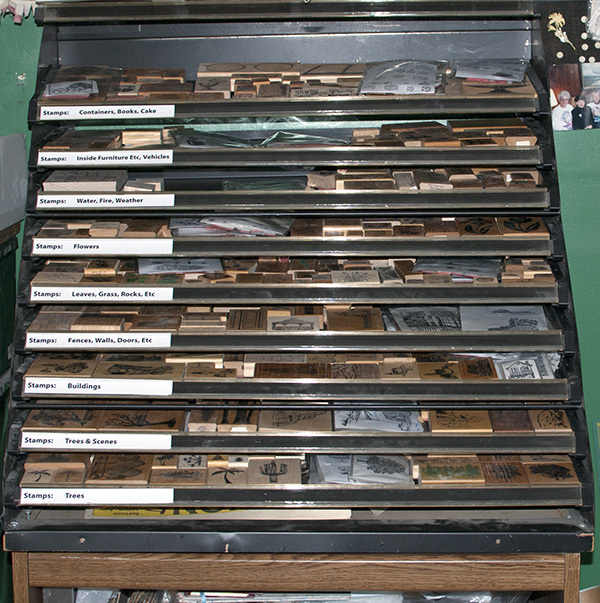 The third type of stamp storage is a drawer system of sorts. It is a paper sorter from an office supply store with 8″ x 10″ acrylic box picture frames serving as “drawers”. It sits on a second hand wide chest of drawers shared by a relative years back where I store more supplies. I have a couple boxes of holiday stamps sitting on top of the paper sorter. I originally had paper in the paper sorter, but moved the paper to another mail sorter unit, opening up these for stamp storage. I’m not sure who first thought to use the acrylic box frames for stamp storage, although I remember that Dee Gruenig used to puzzle piece stamps into this type of frame, put plastic wrap over the stamps temporarily to hold them in place, and flip the whole thing over to scan the index side. She would print it out actual size, trim it and put it into the bottom of the box drawer, making it easy to put stamps away. I didn’t do this with mine, but if your stamps are packed tight, it can save you time in the long run when putting stamps away. Everyone’s stamp collection is unique, matching their own tastes in stamping. 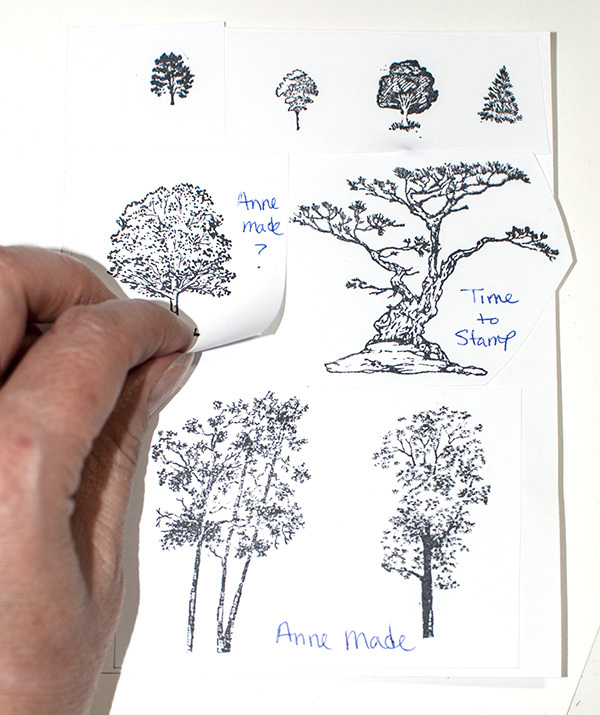 I have always leaned toward scene stamping, so many of the largest drawers in the thread display unit are scene elements like trees and grass and buildings. 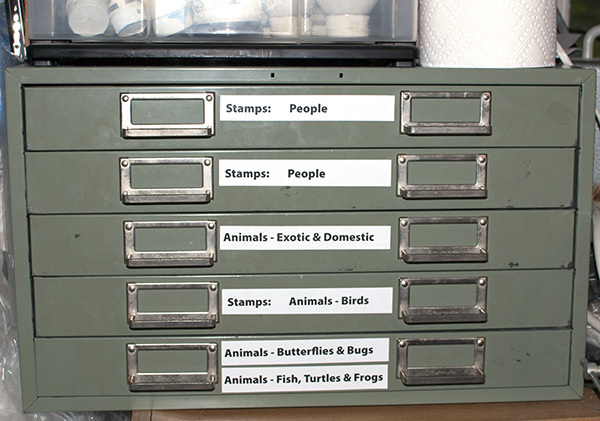 I put people and animal stamps in the metal drawer unit. 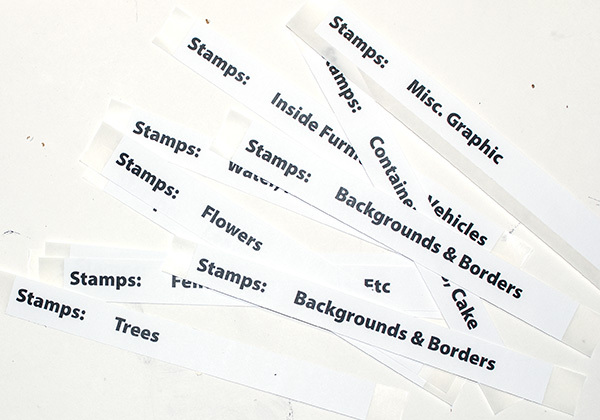 The paper sorter unit has text stamps, backgrounds and borders and other miscellaneous stamps. This works for me. 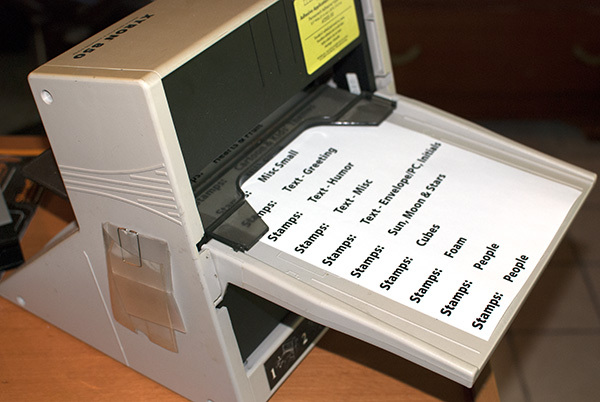 To label my stamp storage, I printed each drawer’s contents in large bold text, slid the printed paper through my Xyron machine to add adhesive to the back and then sliced them into labels using a paper cutter. I could have printed them onto pre-cut labels, but I wanted to be able to print the text whatever size I wanted without having to worry with getting them placed right on label sheets. Doing it with the Xyron was quick and easy. To get my unmounted stamps stored with my mounted stamps, after mounting them on cushion, I stamped each image in black ink on white computer paper. I cut the index out and used a piece of removable double-sided tape to tape several of these stamped indexes onto a 4 1/2″ x 6″ piece of paper. I used the removable tape and separately cut indexes so that I can move stamps around later if I find I want to reorganize. Then I slipped the paper and the cushion-mounted stamps into a clear plastic sleeve. (Here you see the back side.) Right now each sleeve holds cushion mounted stamps that fit the theme of a particular storage drawer. I left space in the drawers for the sleeves. I can stack three or four sleeves in the space where one large mounted stamp would otherwise fit. So there are sleeves full of cushion mounted trees in the tree drawer and sleeves of cushion mounted people images in the people drawer, etc. 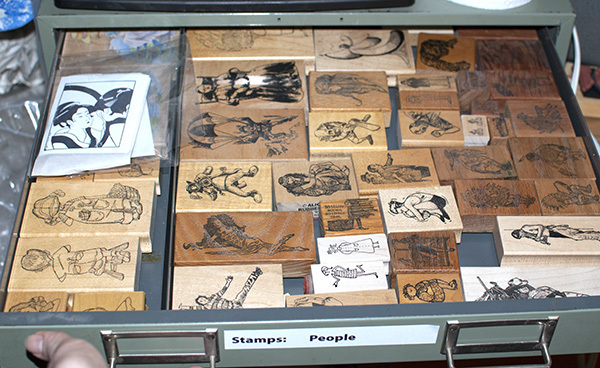 I also tried to leave at least a little space in most of the drawers to allow for future stamp purchases. I also have a few shallow plastic baskets in the mail sorter unit that hold other odds and ends of bulkier stamps like cube stamps and foam stamps that don’t easily fit elsewhere. I’m hoping to get my Rollagraph wheel storage completed later this week. (I’m waiting on some husbandly assistance for that one.) I’ll show you that when I am done. I don’t claim that this is the best way to store stamps. It is just the way I store them. 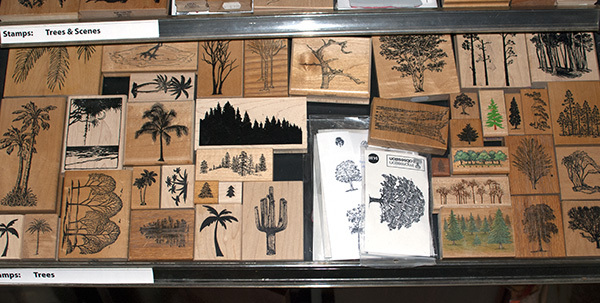 Some stampers like to have all of their stamps mounted on wood and displayed on narrow wall shelves. This can be very decorative and inspiring, but I don’t have enough wall space for that. Some purchase custom made wood stamp storage units that I envy greatly but that don’t fit my budget. Others like all their stamps unmounted and stored in books or filed on storage cards. That seems like a good way to do it, but I find that I personally like to see the stamps spread out in front of me all at once, so that if I am looking for a house image for example, all of the house stamps I’ve got are right there in view. This is a system that has evolved over the last twenty years or so and will probably continue to evolve as time goes on and I purchase more stamps. How do you like to store your stamps? What works for you? I love seeing real working studios instead of the “way to pretty to make a mess in” ones on Pinterest;) Well done Nancie! I do pretty much the same as you, Nancy, except that I don’t have enough shallow drawers. I have too much invested in Iris carts that used to work well. So it’s a bit unhandy to lift out the picture frame storage trays as I look for a particular stamp, but that’s as good a solution as I have at the moment. (Maybe I should send some of my stamps to other homes? That’s so hard!) I do keep my cling mounteds with the wood mounts. Some cling to the storage sheets but some do not, so I will try your idea with the plastic bags. Thanks. Good ideas. 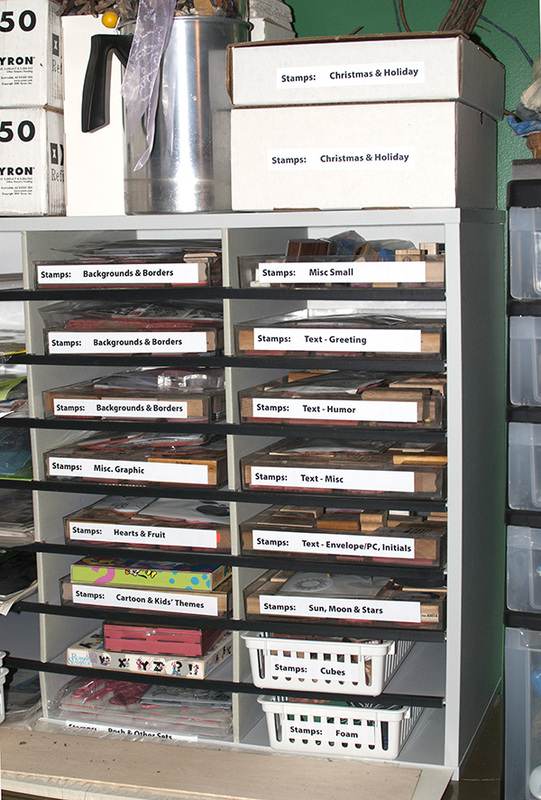 I envy your stamp storage space…well done! Since my studio doubles for the laundry room and my office, I have very little space to store stamps. My solution…My husband built wonderful finished wood shelving above book cases along one side of our garage (Various items in plastic shoe boxes from the Dollar Store go on the book cases). I use pizza boxes lined with aluminum foil to store my stamps with the boxes labeled by category and in an A-Z fashion on the shelves. I can stack 6 boxes high per shelf so each box will slide out easily for viewing……so far have 80+ boxes on these shelves. Works well for me since my actual studio space is small. Hi Jan, I think most of us have to kind of figure out how to make our stamp storage and working space work. I envy people who have a whole room to devote to a craft area or even better, plan a stamping room into the design when they build their house. (It would be so great to have tons of storage space and a sink!) But you do what you can with what you’ve got. My bane is lack of wall space. My craft area is about a quarter of a larger room. That means I have only parts of two walls, but most of those two walls are filled with windows and doors. (The wall space behind the thread stamp storage unit and the paper sorter unit is the only wall space I’ve got.) So I envy you having all that tall shelf space! 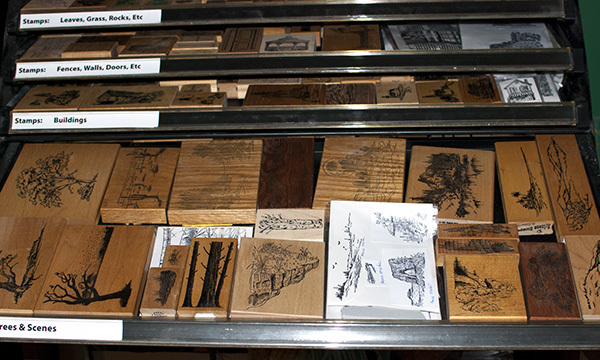 I was the lucky recipient of an oak architect’s cabinet years ago, which has numerous, large drawers–which hold most of my wood-mounted stamps. And there are many (I think they breed!). UNM stamps are on plastic sheets in binders. I also store some UNM in old VCR tape boxes (plastic). Hi Nancie :) I really like your shallow drawers. Mine are still in those tall iris carts and there aren’t enough shallow drawers on them. Or maybe I just have too many stamps lol. Actually I’m in transition right now so my stamps are everywhere ( various iris carts, plastic bins and shoebins). It will be nice to finally have a place for everything so there’s less digging around. :) can’t wait to see your entire stamping area. I need some inspiration!